Olga (Julia Vysotskaya) is a beautiful Russian countess and member of the French Resistance; Jules (Philippe Duquesne) is a French-Nazi collaborator who is assigned to investigate her case; and Helmut (Christian Clauss) is a handsome, high-ranking, yet naïve German SS officer who once fell madly in love with Olga and meets her again when she is shipped to a concentration camp. While they recount their stories, the film drifts between the bloody end of World War II and the gilded, halcyon days when their destinies first crossed. Victim, bystander, or monster – director Andrei Konchalovsky collapses these identities, offering a new perspective on the Holocaust. 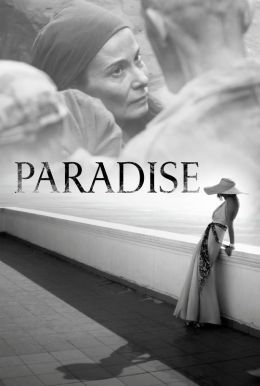 Shot in stunning black and white, the film depicts the morally complex choices that one must make during dark times in search of PARADISE—a look at the past and its lessons for the present.